In the 150 years of policing on Vancouver Island, six of our officers have lost their lives as a direct result to their commitment to public safety. Through a dedicated research effort by the Victoria Police Historical Society, our officers were honoured with the installation of a Memorial Cairn at our Headquarters. Their names have also been added to the BC Law Enforcement Memorial on the grounds of the Provincial Legislature and the National Police and Peace Officers' Memorial in Ottawa on Parliament Hill. Our first Fallen Hero , Cst. Johnston Cochrane, was the first law enforcement official known to have been killed in the line of duty in the history of what is now the Province of British Columbia. Our most recent line of duty death was April 11, 2018, when Cst. Ian Jordan succumbed to injuries he received in a collision while responding to a call on September 22, 1987. Cst. Jordan never fully regained consciousness. Constable Johnston Cochrane was shot and murdered on June 2nd, 1859, near the Craigflower area. Constable Cochrane had been on his way to arrest a person suspected of shooting a pig. Constable Cochrane had gone over the bridge at 3 pm on his way to Craigflower. Not finding the suspect, he left Craigflower at 5 pm to re-cross the Gorge on his return to Victoria. The next day, his body was discovered in the brush a few feet off the bloodied Craigflower Road. Constable Cochrane had been shot twice, one in the upper lip, and once in the temple. It appeared that he had been ambushed by someone laying in wait. A suspect was arrested on June 4, but was released due to a "water-tight" alibi. A second suspect was arrested on June 21, but the charges were also dismissed for lack of evidence. Constable Cochrane's murder was never solved. Constable Cochrane was buried in the Old Burying Grounds (now known as Pioneer Park) at Quadra and Meares Streets in Victoria, British Columbia. He was married and had children. A public subscription was raised for this "good officer's" widow and family. Constable Johnston Cochrane was born in Ireland and resided for a long time in the United States. He was employed by the Colony of Vancouver Island as a Police Constable keeping the peace in the early years of Fort Victoria. Constable John Curry was a foot patrol officer on duty in the area of the downtown core around midnight, the night of February 29th, 1864. Constable Curry had been told that a potential robbery may take place in the near future somewhere along Store Street. He was on a foot patrol of the area that night. Also in the area was an armed night watchman, Special Constable Thomas Barrett. Barrett discovered an insecure door at Mrs. Copperman's store located in the alley behind Store Street. Upon investigation, Barrett found a burglar inside the store. He fought with the burglar but was overpowered and beaten by a second assailant. The two burglars then fled into the alley. Barrett used his whistle to call for assistance. Special Constable Barrett staggered through the store to the outside where he observed a figure rapidly approaching down the dark alley. Constable Curry, who had heard the whistle call, was coming down the alley to assist Barrett. Barrett, during his testimony at the "Inquisition" held some two days later, stated that he was certain that this figure was his attacker or the accomplice. Barrett yelled out to "Stand-back, or I'll shoot." The figure continued to charge forward and a single shot was fired. Barrett had shot Constable Curry. Constable Curry died about five minutes after receiving the wound. Before dying, Constable Curry stated that it was not he who had struck Barrett, the night watchman. Constable Curry was buried in the Old Burying grounds, (now known as Pioneer Park) at the corner of Quadra and Meares Street, Victoria, British Columbia. He was a single man. Constable John Curry was born in Durham, England and had joined the Department in February of 1863. The Inquisition recommended that the Police should utilize "special passwords" to identify themselves. The press later stated that Police should adopt "a regulation enforcing the wearing of a uniform by every officer." Constable Robert Forster was on duty as a Motor Constable at the CPR Docks on Belleville Street, located in the Victoria harbour. He was operating a police motorcycle during the afternoon of the November 10, 1920, when he was accidentally hit by a vehicle. Constable Forster was taken to St. Joseph's Hospital in Victoria and was operated on for internal injuries. He survived the first night, and had a slight rally on the following day. Then he took a turn for the worse. Constable Robert Forster's brother, Constable George Forster, also of the Victoria Police, was rushed to his side. The two brothers were together when Constable Robert Forster died at approximately 8pm on the 11th of November, 1920. Constable Forster was buried in Ross Bay Cemetery, Victoria, British Columbia. He was a single man. Constable Robert Forster was born in County Cairns, Ireland. He immigrated to Canada in 1910 and joined the Victoria Police in 1911. When World War 1 was declared, he immediately enlisted in the Canadian Expeditionary Force. 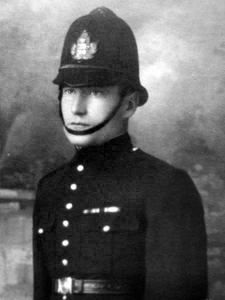 Constable Forster returned to police duties upon his demobilization in 1919. His funeral procession was "nearly three-quarters of a mile in length." 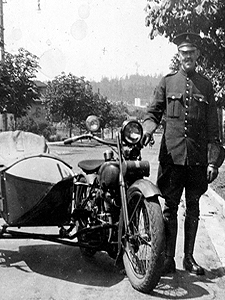 Constable Albert Ernest Wells was a motorcycle patrol officer. He was on duty in the area of Hillside and Quadra on Saturday, December 17, 1927. Constable Wells was proceeding west along Hillside Avenue at approximately 12:30 am, Saturday morning. Constable Wells stopped to speak to a pedestrian about one hundred yards from the Hillside Avenue and Quadra Street intersection. He then resumed his approach towards Quadra Street. Constable Wells then proceeded to Quadra Street where he made a left hand turn in order to go south along Quadra. Unseen by Constable Wells, an automobile was proceeding along Quadra Street at a high rate of speed. Spotting the speeding vehicle at the last moment, Constable Wells unsuccessfully attempted to avoid the collision. The sedan struck the sidecar of Constable Wells who was thrown off his motorcycle. Seriously injured and unconscious, he was taken to the drug store at Quadra and Hillside while he waited to be transported to Jubilee Hospital. Constable Wells died two days later. The driver of the speeding vehicle sped away from the scene. He was later arrested and charged. Constable Wells was buried in the Ross Bay Cemetery, Victoria. He was married and had two small children. Constable Albert Wells was born in Birmingham, England. He had immigrated to Canada after World War 1. 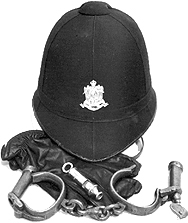 Constable Wells had been a member of the department for two years and nine months. He was known to be a "crack revolver shot." Constable Earle Michael Doyle was riding northbound on Douglas Street at approximately 9:00 pm on July 12, 1959. Constable Doyle was in the curbside lane with a car abreast of him in the centre lane. In the 3100 block of Douglas, vehicles in the centre lane of both sides of the street had stopped. The cars had halted to allow both a southbound vehicle, and a northbound vehicle, to make left turns. The southbound driver did not see Constable Doyle approaching in the curbside lane. The automobile turned east into Fred's Esso Service at 3115 Douglas St. Constable Doyle was hit by the turning vehicle and was thrown from his motorcycle. Constable Doyle was wearing the new police motorcycle helmet, issued only during the last two weeks to Traffic members. The helmet apparently was released during the initial stages of the crash. Constable Doyle was seen to attempt to protect himself prior to hitting his head on the pavement. He was rushed to St. Joseph's Hospital for treatment of multiple injuries including a skull fracture. Constable Doyle succumbed to his injuries some 20 hours after the crash. Constable Doyle was buried at Royal Oak Burial Park, Saanich, British Columbia. He was a married man and had three young children. 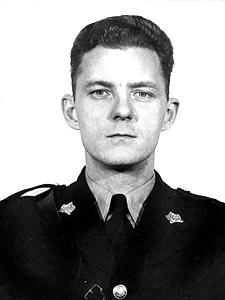 Constable Earle Doyle was born in Moosejaw, Saskatchewan. He had been with the Victoria Police Department for just over eighteen months. The last year had seen him assigned to Motorcycle duties as a member of the Traffic Unit. 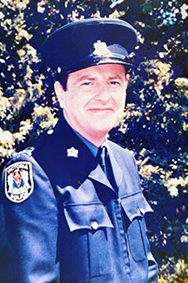 On April 11 2018, 66-year-old Victoria Police Department Constable Ian Jordan died after receiving a traumatic brain injury 30 years ago, following a serious vehicle incident while responding to an early morning call. Constable Jordan was working the nightshift on September 22, 1987, and was at the Victoria Police Station at 625 Fisgard Street when an alarm call was received from 1121 Fort Street. Believing the call to be an actual break and enter in progress, Ian rapidly made his way to his vehicle parked outside. The platoon dog handler was traveling south on Douglas Street after having “called for the lights” at Douglas and Fisgard; asking that dispatch switch the signals to red in all directions. “Calling for the lights” was normally done so that dispatch staff could switch over lights to red, stopping any and all other traffic and giving the unit that made the call clear access to its destination. Ian’s vehicle and another police vehicle collided in the intersection resulting in serious leg injuries to Cst. Ole Jorgenson. Ian, however, was gravely injured and never fully regained consciousness. Ian was 35 years old at the time of the incident and he left behind his wife Hilary and their son Mark.